It's one of those nights when my mind refuses to take a break and I lie awake browsing social networking sites after reading articles on my phone's news application disheartened and praying for fellowmen affected by a super typhoon. As I lazily scrolled my FB newsfeed my heart quivered and my eyes got misty when I read a post by a kind-hearted pediatrician asking for prayer and support for the fast recovery and possible kidney transplant of a nursery nurse I know to be very angelic and hard-working. It pains me to think of her suffering and that of her kids' lives. I am glad though that I CAN DO SOMETHING! We all have the chance to SAVE JENNIE'S PRECIOUS LIFE. My birthplace Lorma Medical Center with its caring staff has organized its 1st Kidney Walk which aims to make a difference in the Kidney community and take lifesaving steps to help others. The purpose driven walk will be on nurse Jennie's birthday, the 16th of November at 5:30 am. All proceeds are for Jennie's transplant program. 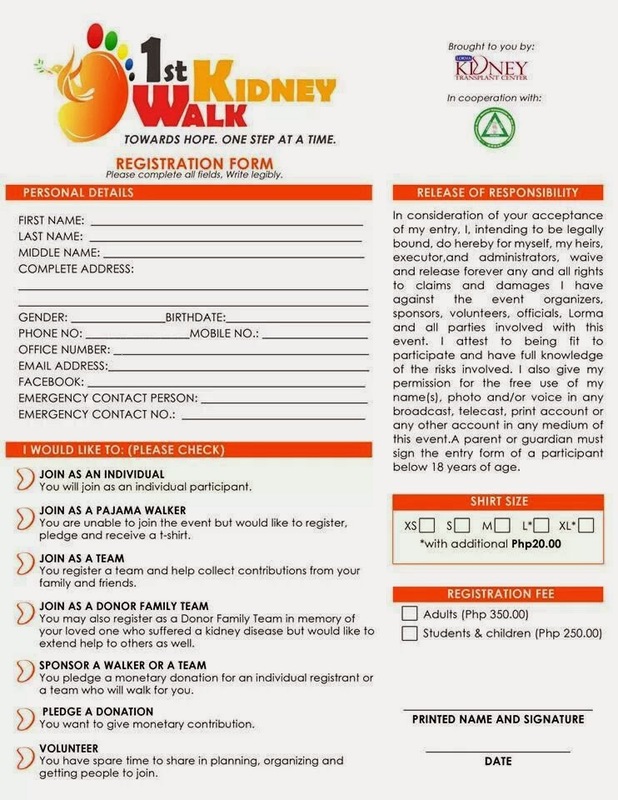 For detailed information and to register for the walk, sponsor a walker or a team, pledge a donation or purchase fund raising items you may contact the organizers through the following phone numbers- 09178673632 or 072-700 0000 local 200 or send them a message through e-mail here . Now I can sleep because I have done the first part in helping create the miracle for Jennie. Please join everyone in sharing this chance to save a LIFE, a nurse's precious life♡. what a beautiful, heartfelt entry!! it's just wonderful to be involved in the "giving back" process. we often get, more then we give!! i am an organ doner, for when the time comes....i hope i have something good, left to give!! Very noble!! God bless those generous hearts! I am sure with this post many people out there would reach out to this program. You really have such a generous heart sis! hoping and praying your friend nurse will get the kidney transplant that is intrumental to her healing Zen. This is one of the best blog post I've read tonight. You did the right thing helping them to spread this kind of good cause. I hope to see more people like you,sis. I was an active member before in a reach out program.I hope to go back one day. Helping for a cause is great and honorable way to reach out for other people. cheers! With caring Samaritans doing their part in this noble cause to save a life. Then I believe God in His own time will do His part. What a great cause! I will also be praying for Nurse Jennie! You are so good to help them out, a worth cause though helping someone's life . Thanks for sharing this again, ate. As I always say, it's good to read and hear about people helping others :) This is a good cause and will surely be a successful one. Prayers to Nurse Jenny. It is good help others in need. That is one awesome cause Ate. It is well-appreciated by the people affected!